As the proud Principal of Francis Scott Key Middle School in Montgomery County, my staff and I work hard to ensure that all of our students start their day off right by eating a nutritious breakfast. Over 90% (approximately 900) of my students partake in our MMFA free breakfast program. On a personal note, I grew up the child of two working-class parents who worked tirelessly to clothe, feed and nurture five children. As a child, I participated in a free breakfast program at my school. I can testify, first-hand, that the program had a positive impact on my life and learning. Today, as a school principal, I have seen the positive effect the MMFA program has on the students in my school. When my students eat a nutritious breakfast, they are alert, engaged and ready to learn. Every morning when my students enter their classrooms, they have a nutritious breakfast waiting for them. We call this time “Books and Breakfast.” Our students enjoy a healthy breakfast, while reading a book of choice and in some cases simultaneously listening to soft music. I can tell you that our students really enjoy this time and it enables them to access the curriculum at higher levels and appropriately socialize with their teachers and classmates. Our students and staff are so excited about the MMFA program, we even made a commercial starring students, posters advertising the importance of eating a nutritious breakfast, and PSAs for our morning show. We know it’s important because the numbers show that one out of five school-aged children struggle with hunger in this country. There are teachers and principals all over this country who will tell you the same thing. There are children in classrooms all over this nation – in our cities and in the suburbs who are coming to school too hungry to learn. In some cases, the nutritious school breakfast and school lunch are the only meals students have on a daily basis. 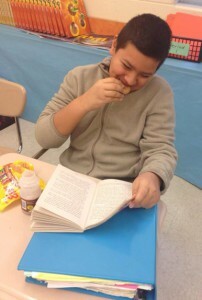 The MMFA breakfast program gets my students reading and geared-up for a full day of learning. I could not imagine my school without the MMFA program. At my school, we know that eating a nutritious breakfast is the KEY to our success!